This resources is outdated and unmaintained : it won't work with recent version of Mypaint. 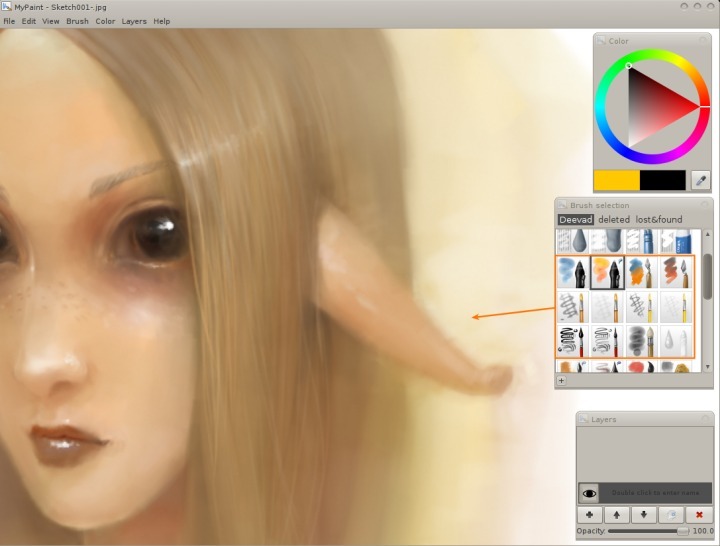 My V4 brushkit for Mypaint 0.9 ( and + ) is out ! I took the time this start of week to clean my production kit, and draw better icon to share it for free to download. Click on 'read more' button to read the complete version of the article, with preview, exemples, download links , installation and licence instructions. More tools 'variations' than in the previous kit, for a faster workflow. All the V4 Brushkit are optimised to produce bigger artworks at better resolutions, you should set your default zoom at startup at 50% (Mypaint>edit>preferences>view) for a better experience while using them. [picture exemple]. Sorry if your machine slows-down, but V4 is clearly a production brush kit designed for professional use. Brush are not labeled with their name as in the 'transitional V3+ BrushKit' I created for Mypaint 0.9 release. The new icons were painted in Mypaint preview square on the fly. The Artpen tool in action ; a lineal brush with a good nervous sensivity to pressure, and a good tool to draw line with 'shift' too. Ideal for concept art works. A set of 4 Eraser , usefull during sketching ; The 'e' key is fine in Mypaint, but many times you just need to erase a part of the drawing, a detail or just brighten a zone with a kneaded eraser to redo a proper line over, keeping the guidance of the old line. All the V3 'flat brushes' were renamed to 'knifes', it's easier to select them this way, and adds more diversity in the icons. I use them often when I want to block a shape directly into digital painting. The main part of this V4 is about digital painting. 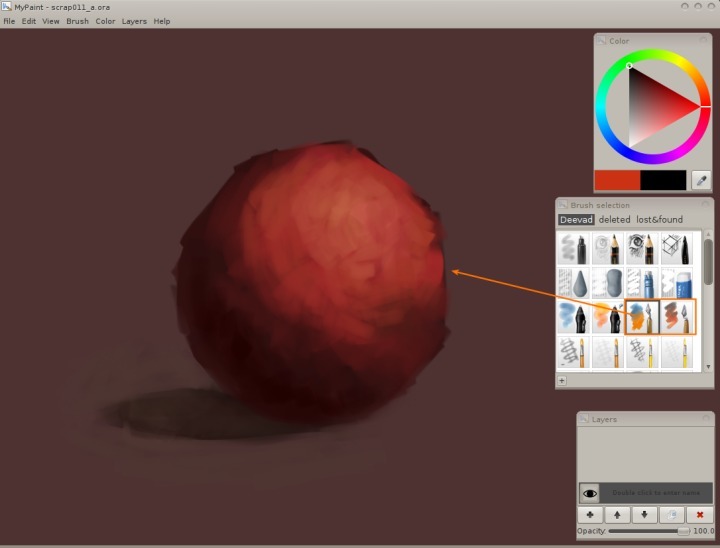 Mypaint still suffers the lack of blending modes, which is an efficient workflow when you are in-between the steps of 'sketching and drawing' and 'painting details'. 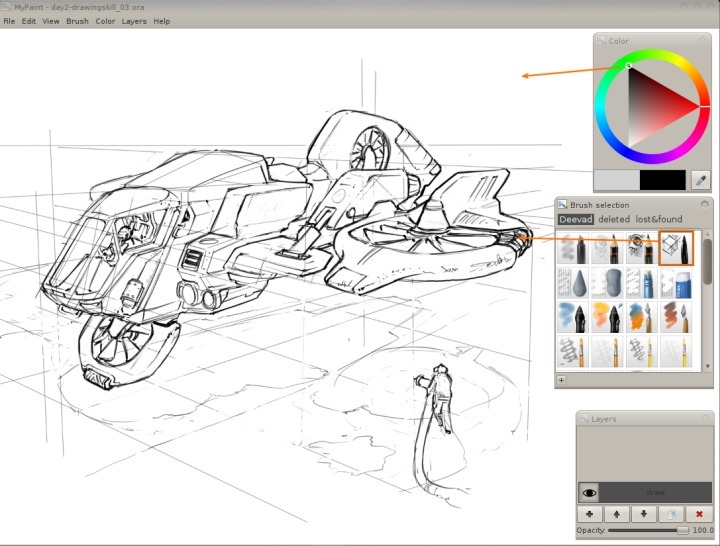 But if you use Gimp on the in-between gap, this digital painting brush set will help you finishing the artwork. This block contains the same brush with variations on opacity and size, this might be a way of 'abusing' the brushlist as a preset collection, but it is really productive, mostly on the detailing part, when you have to paint little details, switching for glazing a part, or covering another part with full opacity. The 'watercolor' now differenciated from the genius watercolors of the Tanda set ( in V3 they were assumed copies ). I set them to my needs when coloring comics as you can see in a video I did about watercolor in Mypaint here : index.php?article53/digital-watercolor-with-mypaint-0-9-and-gimp-painter. I like the waterfringe obtained with Mypaint which ( imo ) breaks the digital and boring effect of the classical flat colors comics usually have. 1. Download (link above) and save the zip file in your computer. 2. Open Mypaint (0.9 or later ) and go to Mypaint>Brush menu and click on 'Import brush package'. A file explorer will open and just select the previously downloaded zip file on your disk. 3. The licence will Pop up now, you just need to accept it to continue. 4. Done! the 'Deevad4' group will appear in Mypaint's Brush list. The distribution and the files are under the creative commons 3.0 attribution. Attribution text : 'by David Revoy | www.davidrevoy.com' . If you want to know more about ; read the following page here. You are free to use those brushes files to draw / paint a commercial project without giving me attribution. You can show them in a screenshot of your workflow or in a video screencast freely without giving me attribution. You can show them in your school if you are a teacher or a student and do a presentation about them on a CMYK ( paper / print ) support or a RVB ( video / internet / presentation / Tv ) without giving me attribution. If you are a developper of an open source software, you can use them in your code for your software without giving me attribution. 4.1 - [01/20/2011] Corrected the wrong behavior of "blending" and "water1" with the help of Darquenoir in the comments. [02/09/2011] Thanks to Slug FortyFive english corrections sent by email. mentioned at the end of the article, 19 january 2011 . Fantastic!!! I'm a big fan of your brushes! Thanks a lot for polishing them so well and sharing with us! First I have to say thank you very much for this fantastic V4 brushkit, but I have some doubts, well, I usually use a lot the Blending brush from V3 but the new blending from V4 looks very different, and this happens like the watercolour brushes, I will show you the examples. I hope this does not bother you, but these changes of these 2 brushes look weird. Sorry if my english is very bad. Merci beaucoup, ça va va bien servir ! Thank you for the positive welcome to this brushkit ! @Darkqueenoir : Thanks for your feedback, this are precious crits for me, and you are right ; those tweaks ( I made with time ) are finally regression from V3. So I reverted and updated the brush kit. You can download and install this V4.1 again after deleting the V4, I also updated the article with a note at the end about this 4.1 ;) Thanks for the screens and links , that's helped a lot to understand. 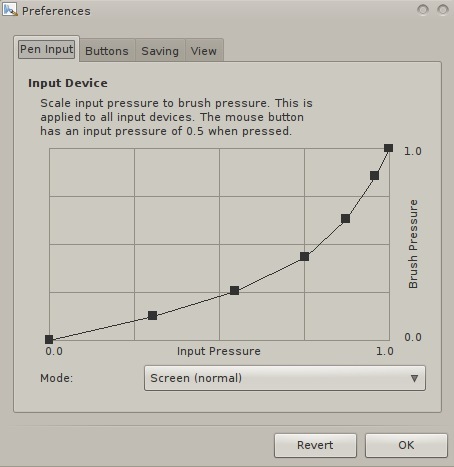 For information : the change to 'water1' was a bug from my bad using of the pressure curves at one moment. For the 'blending', it was just a reduction of the 'Dabs per actual radius' option ; witch one I decreased automatically to a lot of tools to keep good performance at 50% viewport. Many thanks for the kit, I have seen your V3 time ago, but never tried it, but now I have downloaded the V4 and it's very useful, just what I need to improve time while working. Cool the 4.1 corrected the too brushes. @fromlugdunum: Il ne s'agit pas d'une erreur provenant de mon kit V4.1 mais un problème avec Mypaint 0.9 malheuresement ( C'est moi qui est fait le Bugreport il y a plus d'un mois ) . Quand la dernière brosse sélectionné avant fermeture est vide ou absente à la réouverture ( souvent après un 'pick context' ; touche W , ou bien un remplacement ou un renommage du kit 'Deevad' par défaut dont la selection de la brosse de base à l'ouverture est 'hardcodé' ). A présent tout ça est corrigé dans la version développement Git, mais ça reste un bug ennuyant. Ma solution pour ceux qui restent en V.9 ( et non en V9 Git+ ) consisterai à renommer DeevadV4 en Deevad ( si suppression de l'ancien Deevad il y a ) afin de toujours garder un kit nommé Deevad. @Steven : Sharing and building a collective project is a passion , a kind of video games :) And I always find a bit of time for a passion. @DarioTW: vivat kielbasa :-D I'm a kielbasa fanboy and always bring 2 packs in my back when I go in Poland. Cool article on your blog. @Ecksell : Comme on dit à Toulouse ; avec plaisir ! Thank you very much, David !!. Thank you very much for a wonderful and useful set of brushes. Yours are the ones I use most. The set is varied, yet not too "crowded". Thank you very much, I started using them and they seems very good! The brushes are really nice. I just want to let you know that only after looking at your works I have started working in my paint and gimp. Thank you for the inspiration and sharing the brushes. Thanks! I'll try them out right now! I only hope to do these brushes justice in my art. Thank you once again for your contributions to the MyPaint community, David. I'm confused on the license on this. What are the attribution requirements? One says that it is required, but then the exceptions seem to override that requirement. Thanks you all for the cool comment on this brushkit. @Anony : I know this license may sound complex, it's just a CC-By ( creative commons attribution ) with some case of non-attributing ( mainly during usage ). Next brush kit will be surely full GPL 3.0, as I more and more understand this license. Trop de la bombe de boulette de patate de balle ! Et puis félicitations pour ta future publication sur le CFSL 5 ! bon ben j'ai réussi a installer tout ca, je suis fier de moi ^^. Il me manquait plein de packages..
@yoann : Pas de soucis avec la noob attitude, on a tous commencé un jour et moi c'est pas si loin avec Linux. ( pour l'installation depuis la version développement, désolé du retard de réponse ; j'ai expliqué ça ici au deuxième post : http://forum.ubuntu-fr.org/viewtopic.php?pid=3964728 ). En attendant, j'retourne gribouiller en espérant que ce sera moi le prochain publié ! Je suis assez émerveillé de voir oh combien il est agréable de travailler avec MyPaint. Si au départ j'étais dubitatif quand à l'espace de travail "infini", cela se révèle agréable au moment du rough et de la recherche de composition. Je regrette juste de ne pas avoir les modes de fusion de calques habituels, mais j'ai vu sur le forum de dev qu'apparemment ca devrait être implémenté plus tard. Finger crossed pour ne plus avoir a sortir de MyPaint ^^. D'après ce que j'ai compris David, le workflow est 99% Linux, si ce n'est lors du passage en CMJN pour du print ou tu as recours à Photoshop ? En tout cas bravo pour ton travail et ta participation dans la communauté. Je pense participer modestement aussi ! Et pour la question sur le 99% open-source , c'est bien ça. 1% de mon bon vieux Photoshop CS2 installé avec wine pour tester mes réalisation dans la chaine graphique d'Adobe ( incontournable dans le métier ). Bref, ouverture de PSD envoyé en CMYK et enregistrement/export avec des profil colorimétrique des imprimeurs. Il faudrait que je test si je pourrais m'en séparer avec Krita. Oh, je suis très intrigué par le split screen ! Est-il une même version en petit de la surface de travail ? J'ai découvert il y a peu, par un tutoriel de bobby chiu, combien il est intéressant de travailler ainsi. Est ce que ce split screen sera la même chose ? Fantastique ! Ca va clairement être un outil intéressant, surtout que l'outil de symmetry peut être vraiment bien pour faire du concept de vehicules par exemple..
D'ailleurs ca me fait penser qu'un outil de symmetry comme dans Autodesk Sketch/Sketchbook Pro serait franchement génial, je vais poster ca sur le forum des features de mypaint si ce n'est pas déjà fait. As tu pu tester les modes de fusion des calques sur la version de dev de Mypaint ? J'ai pas bien compris l'idée du brush mode.. C'est du genre ou tu peux peindre en multiply ou overlay ou autre avec un brush ? Pour le brush mode / layer mode ; c'est comme dans Gimp : la fusion peut être entre les calques ; ou en direct sur un calque plat dans la brosses ( mais généralement qui ne fonctionne pas en calque ). Les dev' de Mypaint recherchent un système nouveau depuis 1 ans et demi , un mode de fusion de brosses qui fonctionne en calque ( par duplication du fond ). Sinon, nouvelle à part ; la fonctionalité 'frame' qui gère la feuille infini ou non à été mis dans la version Git:master hier ; signe de stabilité. Au sujet de l'outil symmetry dans Krita, ca semble effectivement prendre un tres bon tournant !! Je posterai dans le forum pour savoir s'il est aussi possible de reflechir a des symetries ou l'on puisse paramétrer le nombre d'axes. 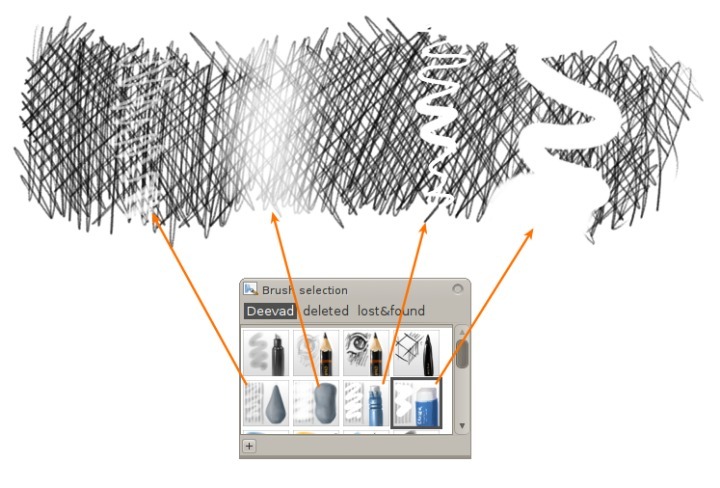 Je n'ai vu cette feature que dans autodesk sketch 2011 pour le moment, et c'est un truc drôlement pratique pour certains travaux (de l'ornement par exemple). Enfin tant qu'il y aura les bons modes qui vont bien, moi je vais pas chipoter ! Je suis complètement surexcité de penser à quel point la communauté de l'open source est 1000 fois plus puissante qu'une firme.. Vous voulez une feature pour votre logiciel ? Discutez en et développez la ! Si je ne doutais pas de mes capacités de prog, je me lancerai dedans bien volontiers :p.
Merci deevad pour cette discussion, je suis trop motivé ! this works for linux? how do i install it? @Dan : I'm on Linux Mint, yes it works via the menu of Mypaint (0.9 and above ) :) You can also use the old method , via ~/.mypaint ; as described in the V3. Have fun with painting. I really appreciate what you do for the open source graphic world. Ohh, i am so much awaiting for these new layers ! Hope they will be on the next version ^^. I am currently making an illustration with MyPaint, and I am noticing how much I would need a precious feature : the "preserve transparency". I have posted about it in the forum, and I will make a video under photoshop to try to convince our dear developpers :p.
It seems that some are kind of scared about adding new features :p. We have to come with strong cases! For now it is really the feature i miss + the layers. Maybe being able to duplicate a layer and move transform it would be nice, but then it is more a job for a software like Krita where I would set my composition before to paint everything. All that is going on a good way ! Your visual feedback is quite interesting =). I am ok for the multiply one, a bit more sceptical for the overlay one. Since it is one that lighten much, maybe the cursor could be a "sun type" cursor? I really need to go seeing the dev branch ! Is it possible to download these versions with the lock alpha and blending modes already, even it is buggy maybe ? yoann : Good idea, write it on the wiki. For the Download; the links are on the page of the Git branch here : http://gitorious.org/mypaint/mypaint/commits/split-window ( column > Download split-window as tar.gz ) ; and compile the source code with scons. It's generaly not really buggy. I have tested the blending layers ! It is working quite well with the 2 modes (multiply and dodge), allowing to darken and lighten to give volume to a greyscale volume pass + making interesting global light effects. I long already for the layer of color blending, so i can keep the color layer independant from my volume layer. It gives more control and the possibility to try more things with the color pass =). Of course it is possible to make this final color pass in another software, but if it possible to stay in MyPaint it would be really great ^^. i did not see the lock alpha, I hope it is also coming soon =). Have a nice day all of you ! It was a long time since I went to see what sumopaint did ; it looks like a poor performance copy of Photoshop ; but good to see it and to can try it as easy as 2 clicks. I becoming addicted to your brushkit. Wow! I JUST found out about MyPaint! Fantastic! 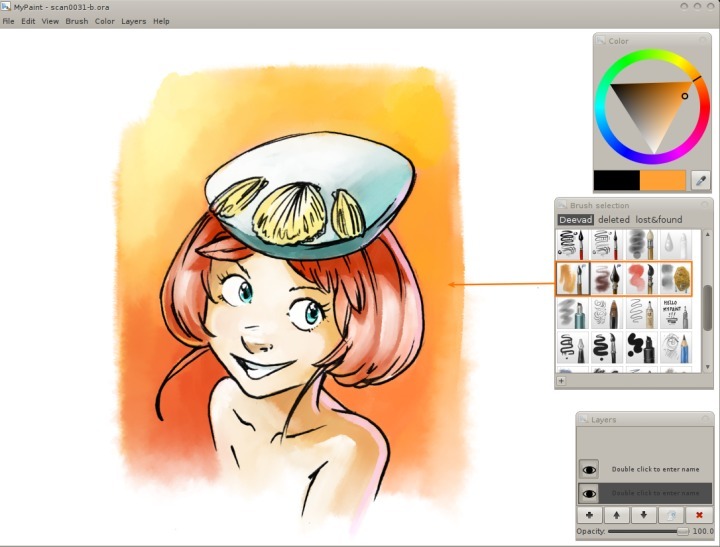 Since you've probably used Corel Painter and other digital painting giants like that, how would you compare them to MyPaint? From what I can tell it looks awesome. BTW, I'm a huge fan of your art and would LOVE to (but can't and am not asking because you are insanely busy, I'm sure) hire you as a concept artist for my project. Thanks for the great brush kit! @Leighton : Thanks for the comment. > Since you've probably used Corel Painter and other digital painting giants like that, how would you compare them to MyPaint? 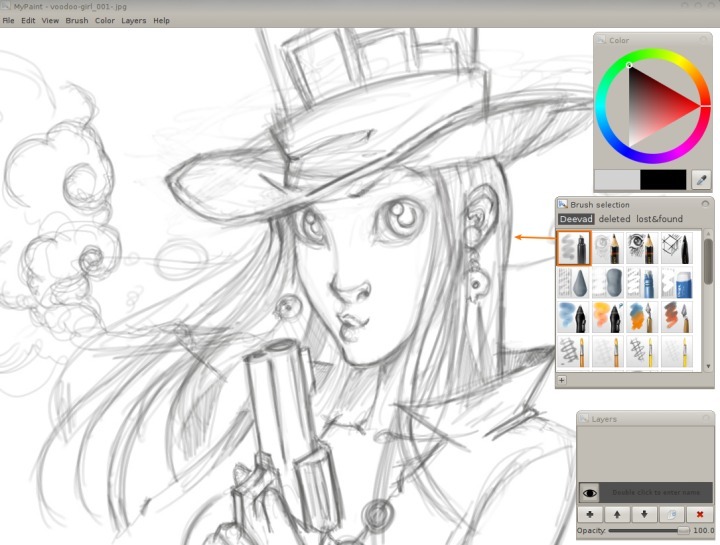 Painter, SAI, Photoshop and Open Canvas are still far ahead compare to the feature you can find in Mypaint alone. 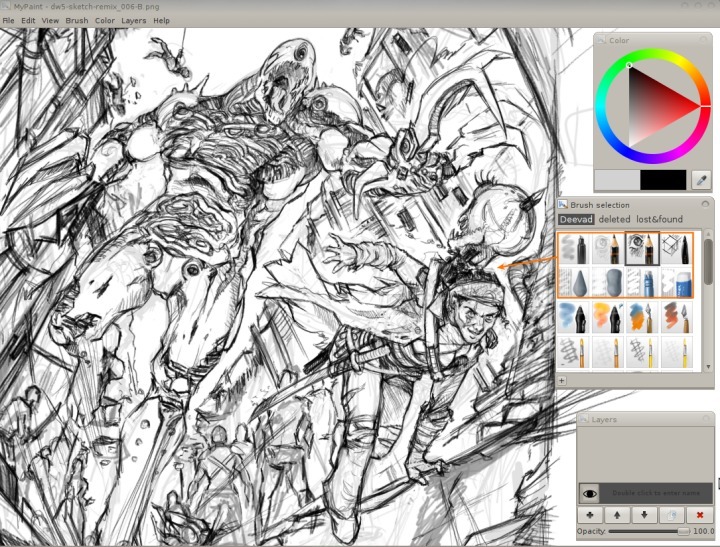 But if you use Mypaint + Gimp , or Mypaint + Krita ( or the 3 ) you can have pretty similar possibilities. Goodness gracious me, this has got to be my favorite brush set of any package I've downloaded for any program ever. I'm in love with the digital painting tools you've created for this one. They're so smooth, beautiful, and natural feeling. I just am ASTOUNDED at the quality that these brushes add to a FREE program. In my honest opinion, I can't see ever purchasing Corel while this program is available. I'm a big fan of your resources. I hope you expand in the future! this was a discovery for me today. I already knew the previous kit, but this is still better. I started using them and they works werry nice. Amazing Brush! I love MyPaint! Waauw , looks great David, thanx 4 sharing ! Thanks so much for the brushes you've created. Most appreciated. If only I could paint and draw as well as you do. Can you post that skill as a zip file for download too? your program is all what I was looking for !! thank you very very very much .. Thanks for your previous brushes. "A programming error has been detected. It probably isn't fatal, but the details should be reported to the developers nonetheless." @Regi : Hey, in recent Mypaint my brushkit is already installed and named 'set#2' , thats why I don't feel to maintain this old package . But if you extract the archive and place manually the *.myb file and the *.png in your .mypaint preference folder , there is great chance for retrieving them all. If you think old brush package should be backward compatible , feel free to report your error to the developpers by filling a bug report. 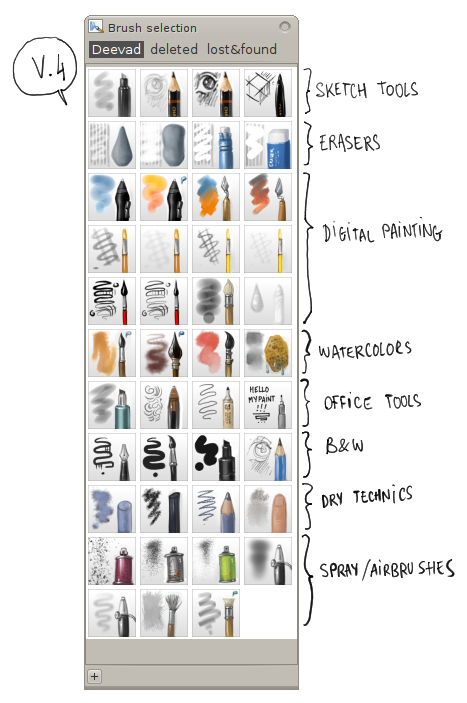 thanks for posting your brush set.what paper size/resolution this set is tuned for? (i am hobbyist,i find some brushes - eg finger smudge grain bigger. )what paper size i must work on?. sorry,ignore above comment.i missed the "setting zoom to 50%"suggestion. I cant live without this package ! Thank you so much for these wonderful brushes! My favourite pack of the all since 2011, it encouraged me to do digital painting/drawing as I was against it before. Hi, thanks. I fixed the link. The page is outdated ( it's written in red ) and only around as archive.